Guwahati: Amid tight security, the much-awaited second and final draft of the National Register of Citizens (NRC) was published today with over 2.89 crore names out of the total 3.29 crore applicants in Assam, Registrar General of India Sailesh said here. Around 40.07 lakh applicants, however, did not find a place in the historic document, touted to be a proof of Assamese identity. A senior police officer said prohibitory orders under Sec. 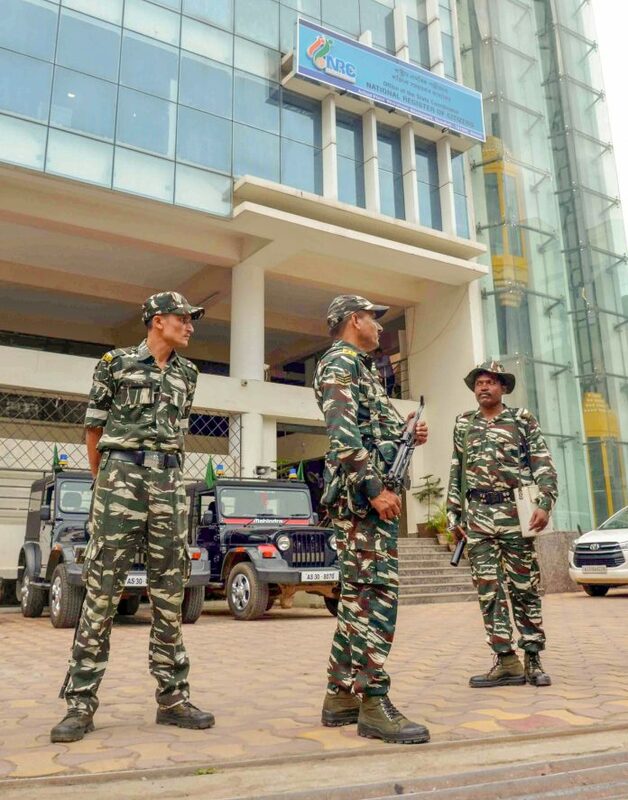 144 of CrPC have been imposed in all the 33 districts of the state as a precautionary measure in the wake of the NRC release. The final draft is available for perusal at all the NRC sewa kendras (NSKs) in the state. The applicants can also visit the NRC website or call 24×7 toll-free numbers -15107 from Assam and 18003453762 from outside Assam – and refer to their 21-digit Application Receipt Number(ARN) to find out the details. Declining comment on non-inclusion of around 40.07 lakh applicants, NRC State Coordinator Prateek Hajela said the exercise was carried out as per the instructions of the Supreme Court. Four categories of people – doubtful voters, their descendants, people whose cases were pending at Foreigners Tribunals and their offspring – were not included in the list, he said. Hajela also said people would be able to reapply for inclusion at the sewa kendras. “The process for making claims and objections will begin on 30 August and continue till 28 September. Adequate and ample scope will be given to people for making objections. No genuine Indian citizen should have any fear,” he added. Assam is the first Indian state where the NRC is being updated after 1951, with 24 March, 1971 as the cut-off date, to include names of genuine Indian citizens. The first NRC draft, with 1.9 crore names, was released during the intervening night of 31 December and 1 January this year. The ground work for this mammoth exercise began in December 2013 and 40 hearings have taken place in the Supreme Court in this regard over the last three years. The application process for the NRC started in May 2015 and a total of 6.5 crore documents were received from 68.27 lakh families across Assam. Minutes after release of the final draft, Union Home Minister Rajnath Singh said the exercise was carried out in an “impartial and transparent” manner. “No coercive action will be taken against anyone. Hence, there is no need for anyone to panic,” he told reporters in New Delhi. Congratulating the people of the state, Chief Minister Sarbananda Sonowal said the “historic day will remain etched in their memories forever”. The process of draft publication was carried out in cooperation with the Registrar General of India, along with the central and the state governments, under the direct supervision of the Supreme Court, the CM said. “For this remarkable feat, I extend my heartiest congratulations to the 55,000 officials engaged in the process of updating NRC and the people living across the Barak and Brahmaputra valleys, plains and hills of the state,” he said. The CM also appealed to people to refrain from making “communal and inflammatory remarks” in the wake of the publication of the final draft. Several north-eastern states which share borders with Assam have also kept their police forces on alert to thwart possible infiltration of illegal immigrants. Indira Gandhi was very clear about the burden due to large number of across the border illegal immigrants. She was not explicit votary of वसुधैव कुटुम्बकम् । In real politics one has to take pragmatic decisions, not just being dogmatic.